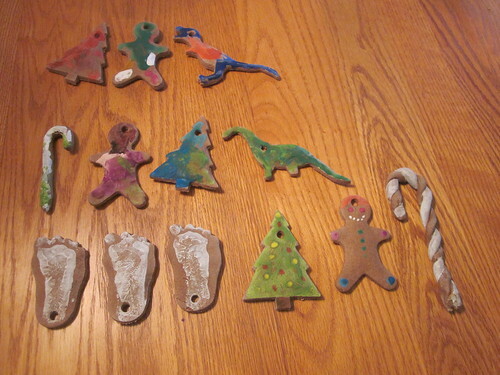 This year, we decided to make a big batch of handmade Christmas tree ornaments for our home, just to make some “homey” Christmas items to decorate with. We decided to make them in the style of Christmas sugar cookies, with dough that would harden and look roughly like such cookies. As we were making them, though, Sarah had the brilliant idea of making extras and giving them away as “add-ons” on some of the gifts we’d already made. “We could just put a ribbon through them and tie that ribbon around a jelly jar,” she suggested, referring to the jellies and jams we had already made for gifts. The ingredients for the dough are simple enough. One cup salt, two cups flour, five teaspoons of cinnamon, and 3/4 cup water (with maybe a bit more). Mix the dry ingredients together, then add the water slowly. Mix it together until it forms a ball, like so. If you find the ball to be crumbly, add a bit more water, a teaspoon at a time, and knead it between teaspoons. If you find it to be sticky, add a bit more flour, a teaspoon at a time, and knead it between teaspoons. Eventually, you’ll find a happy medium – not too sticky, not too crumbly. That’s just what you want. 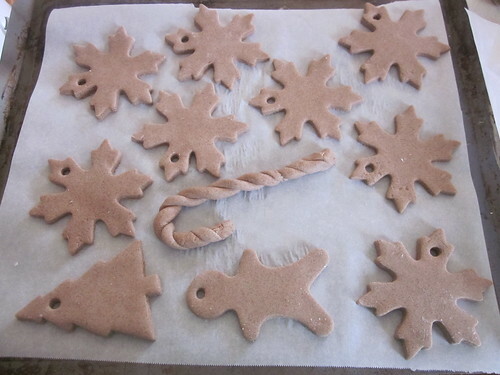 A note on the cinnamon: it’s added mostly to give the “cookie” ornaments a cinnamon smell. I felt that the five teaspoons didn’t give a very strong smell and if we were to make another batch of cookies, I would use at least ten teaspoons of cinnamon. 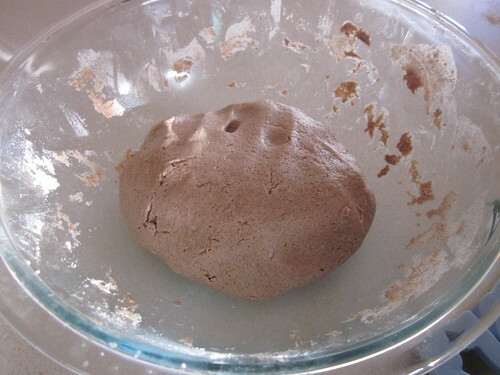 Once the dough is ready, wrap it up and put it in the refrigerator for thirty minutes to stiffen the dough. Then, roll the dough out to roughly 1/2″ thick (about 1.25 cm) – you can be approximate on this – on a lightly floured surface. 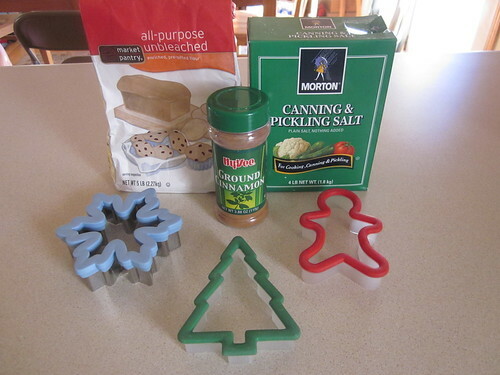 Use cookie cutters to cut the dough into shapes, then use a straw (or another device) to make a small hole on the top of the ornament shape. Then, bake until dry at 325 F – this usually takes about an hour. 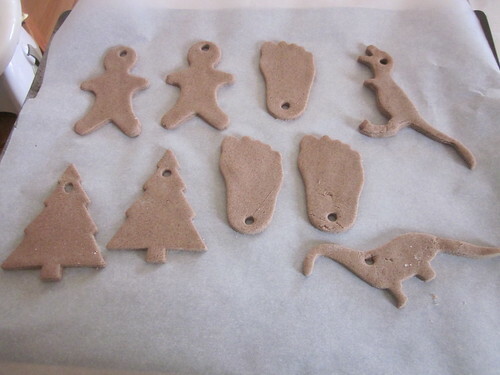 I recommend using parchment paper on top of a baking sheet to bake the ornaments. We turned the leftover dough – the pieces between shapes that didn’t quite amount to enough to roll out again – into candy cane shapes for our own use. 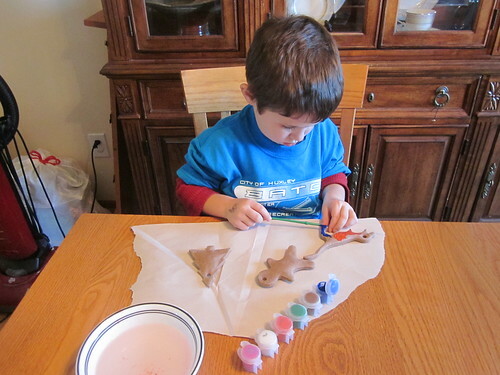 Most of our ornaments were snowflakes, which we chose (for the time being) not to paint. We could have painted them white, of course. After the ornaments were painted, we sprayed them with a matte finish sprayable varnish so they would keep for a long time. We then slipped ribbons through some of the holes to look at our finished ornaments. 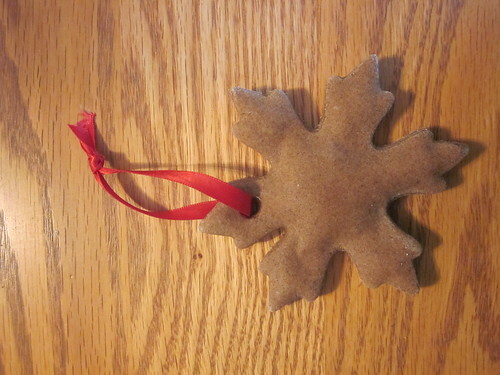 One important thing to note – these ornaments are actually surprisingly sturdy. One was dropped from a height of six feet onto a hardwood floor and as it fell, we fully expected it to break into bits. It seemed almost completely unharmed by the drop, perhaps losing a tiny crumb. We look forward to tying these onto some of the handmade gifts we give out this year – and we also look forward to putting some of the ornaments on our own Christmas tree.